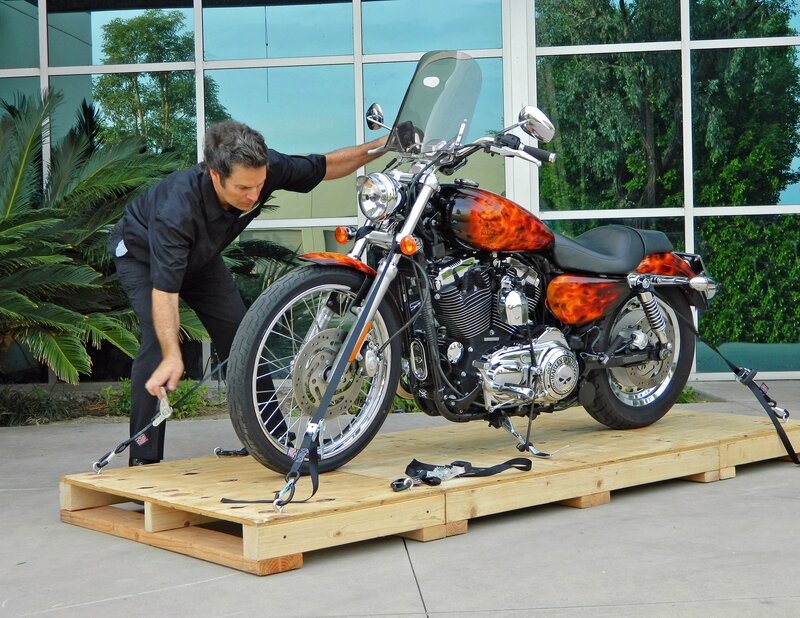 Motorcycle Shippers’ proprietary Cycle Skid™ is a compact, wooden shipping platform that comes with tie-down anchors, soft ties, ratchet straps and a bike cover that create a Perimeter of Protection® around motorcycles in transit. 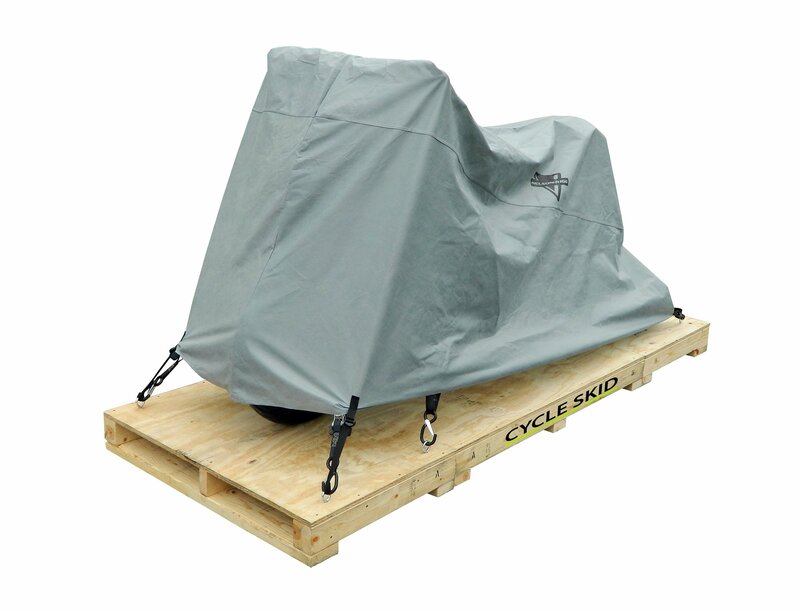 SANTA ANA, CA (November 17, 2016) — Motorcycle Shippers is proud to introduce its proprietary Cycle Skid™, a compact, wooden motorcycle shipping platform that comes complete with tie-down anchors, soft ties, ratchet straps and a bike cover that create a secure Perimeter of Protection® around motorcycles being transported by truck, boat, plane or rail. 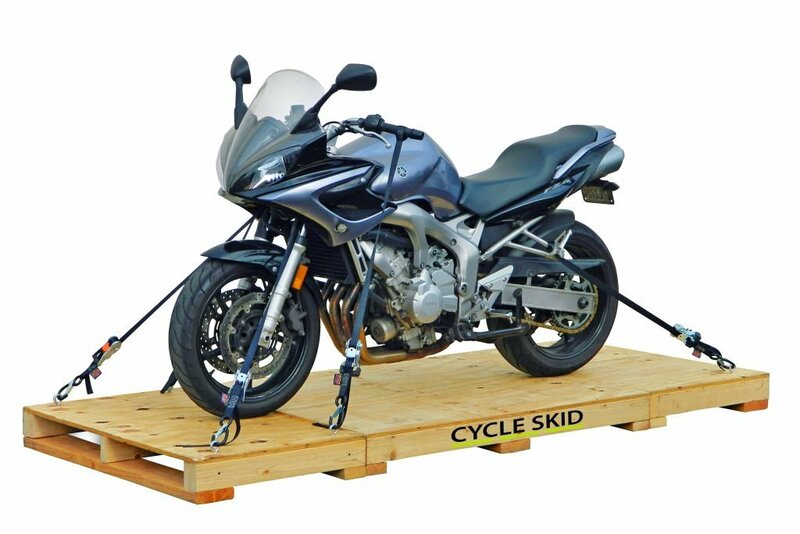 Developed utilizing Motorcycle Shippers’ experience transporting more than 70,000 bikes around the world in the past 22 years, Cycle Skid’s unique, three-piece, slide-together design facilitates quick, one-person setup, simple disassembly and convenient storage. 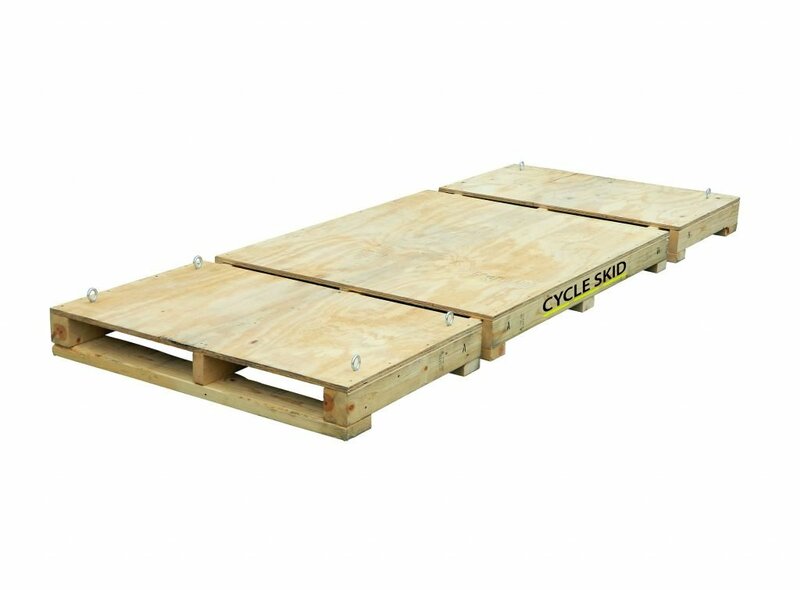 An economical alternative to bulky motorcycle shipping crates that incur huge shipping charges, the reusable Cycle Skid is constructed from durable lumber that complies with all export regulations. Contained within the unit when stored are the universal-fit, water-resistant, breathable bike cover and six of Motorcycle Shippers’ new Soft Cinch™ tie downs. These 66-inch straps have integrated soft-tie loops, carabiner-style locking hooks and 1-inch ratchets rated at 800 pounds. Fully assembled, the platform is 104 inches long, 42 inches wide and has an 800-pound capacity to handle most any bike. Compacted for storage, the skid is half as long and just 11 inches tall. 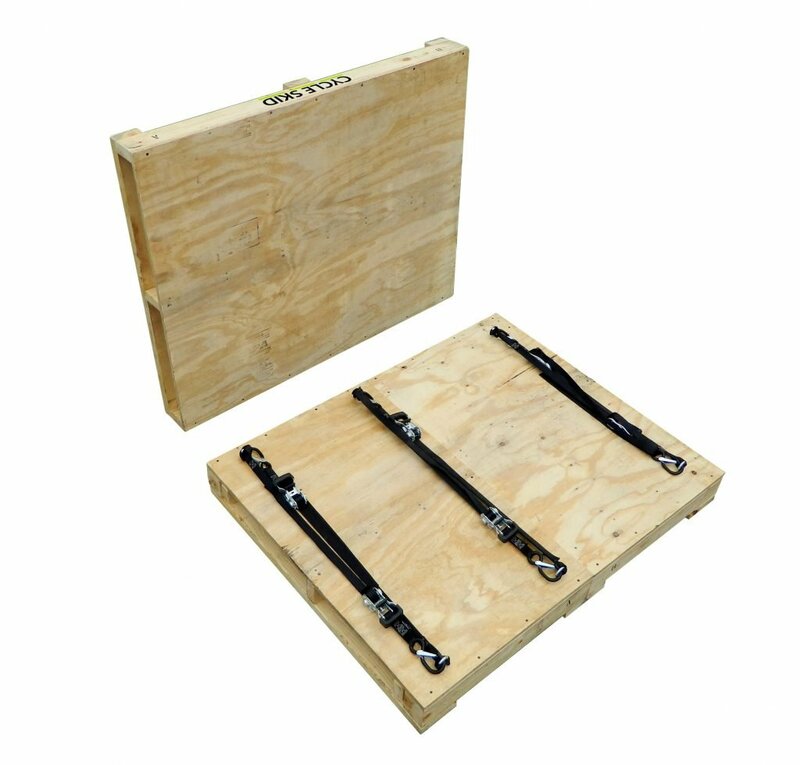 Forklift- and pallet-jack-friendly, the Cycle Skid can be shipped via FedEx and UPS due to its small size when collapsed and weight of less than 150 pounds. Cycle Skid is perfect for globe-trotting adventurers who’ve reached the end of their overland route, domestic bikers sending machines to rallies, motorcyclists making long-distance moves and auction winners fetching new rides. On the commercial side, Cycle Skid is used by trade show vendors, motorcycle tour operators, moving companies, exporters and barge operators to transport bikes between cities or continents. Motorcycle Shippers literally wrote the book on motorcycle transport, then developed industry-standard software, hardware, training procedures and videos to ensure the fastest, safest pickup and delivery. This southern California-based company is the official provider for BMW’s MOA group, Kawasaki’s ROK program, the GWRRA and a longstanding member of the Motorcycle Industry Council. For more information about Cycle Skid™ and bike transportation, visit them at MotorcycleShippers.com, call 800-706-9476 and keep up with the company on its Facebook page, YouTube channel and Twitter feed. 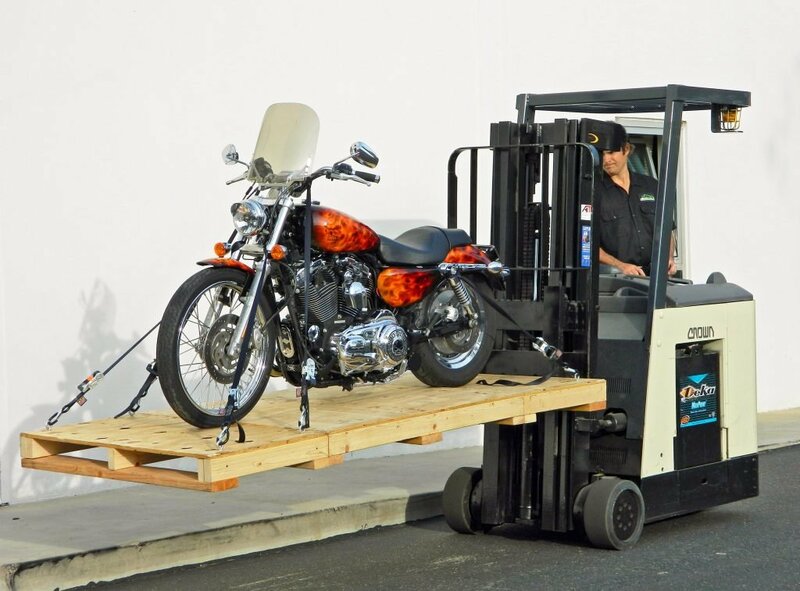 Established in 1994, Motorcycle Shippers has transported more than 70,000 bikes around the world in 22 years with the largest fleet of motorcycle-ready trucks in the United States. Headquartered in Santa Ana, California, the enthusiast-run motorcycle transport company developed the processes, software, hardware, training procedures, manuals and videos for its shipping partner, Specialized Transportation Incorporated. Together, they provide the fastest, safest and most affordable shipping method available for motorcycles, side-by-side vehicles, ATVs, watercraft and snowmobiles. Motorcycle Shippers is the official transportation provider for BMW’s Motorcycle Owners of America group, Kawasaki’s ROK program, the 60,000-member-strong Gold Wing Road Riders Association (GWRRA) and a longstanding member of the Motorcycle Industry Council. 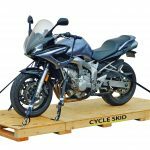 For more information about Cycle Skid™ and motorcycle transport, visit MotorcycleShippers.com, call 800-706-9476 and keep up with the company on its Facebook page, YouTube channel and Twitter feed.